The Shan-e-Punjab Dance School (S.E.P.) began in November 3, 1993, with a group of 13 young girls studying either at University or College or professionally working, two of which are sisters, one member was Sonia’s sister, Mrs. Amy Khangura (nee Grewal). The team of 13 youth got together to start a dance group because they tried joining two current groups at the time in the community and neither provided what they expected from an organization of dance. Therefore one of the immediate goals became to implement things they felt were important in a team environment and continued to develop for the next 25 years, such as acceptance, inclusivity, a sense of belonging, teamwork, empowerment, and recognition. Their first performance opportunity was for the 1994 Victoria Commonwealth Games pre-ceremony event called the Flag of Nations, held for the opening of the Saanich Commonwealth Pool. Ms. Grewal also was assistant to the Chair of the committee for the Flag of Nations. This opportunity came from Mr. Raj and Mrs. Buncy Pagely, key community leaders and role models. In June of 1994, the team also performed at their first fundraiser, organized by Dr. Sidney Price-Sparling, to purchase ethnic dresses for her team that was preparing to perform at the opening and closing ceremonies of the 1994 Victoria Commonwealth games held in the summer. As well in June of 1994, at the annual Folkfest, the team created its first name, spelled Shaanay Punjab, created by Mrs. Balbiar Thiara, a mother of one of the key members of the team. After a year of achieving much recognition through dance competitions, performances and other community work, the team gained popularity and respect for the art form Bhangra. Eventually the team began a multi-cultural program where the team also partook in arts and crafts, storytelling, providing awareness of their cultural heritage in various elementary schools in 1995/96 at the Burnside Elementary School. The team shared its talents with communities north of the Island, participating in many multi-cultural events as far as Parksville, BC. The team was selected three separate times to perform at the CHEK 6 TV (CHTV) Teen Talent Show, and also was a key part of the “All One Family” Event, from 1994-1996, organized by the Municipality of Saanich Multicultural Steering Committee. 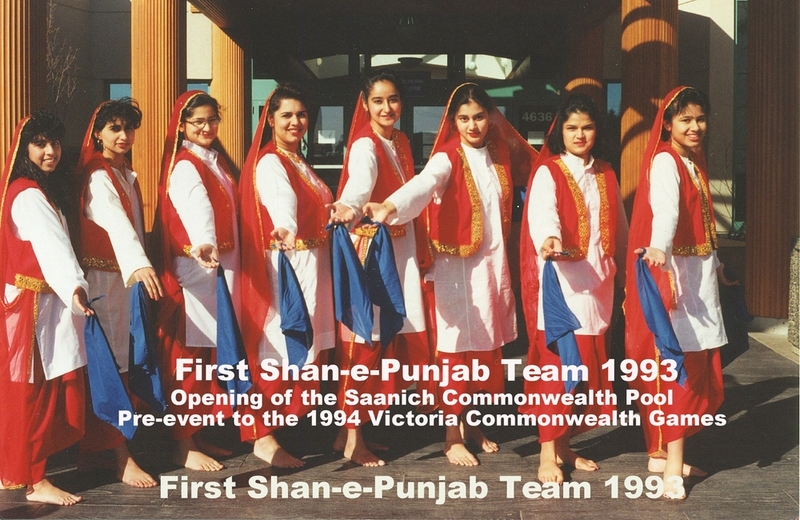 The team was the first dance team to perform the traditional male national dance of Punjab, Bhangra, and to earn in 1996, the Authentic National Dance Award at the Greater Victoria Performing Arts Festival (GVPAF) (previously called the Greater Victoria Music Festival founded by Ms. Sheila Blake). Therefore after families starting inquiring how their children can learn Bhangra, the first school opened in 1996 with 60 students, and the school's first home was the junior school at St. Margaret's School (Mr. Peter Brimacombe). The team became an organization, known by its present name and spelled Shan-e-Punjab Dance, Performing Arts and Heritage School (previously spelled Shaanay Punjab Dance School) teaching classes every Sunday.In 1997, they earned the Adjudicators Award at the GVPAF; the Adjudicator at the time was Mr. Jacques Lament, organizer of the opening/closing ceremonies of the Calgary Olympics and the 1994 Victoria Commonwealth Games opening/closing ceremonies. The team assisted other organizations to build their presence for example, the Diwali event that exists today, started in 1997, and the team’s performances helped to raise funds for the Hindu Parashad Temple. In 1997, the school began the first cultural summer camps of its kind, due to an idea that one of the senior advanced students (currently Manager) had, Ms. Harparam Sra. Thereafter the summer day camps became a branch of the summer programs offered at St. Margaret’s School, thanks to Mr. Peter Brimacombe. Building strong awareness brought much attention from organizations, schools, media, families, government, and businesses and most importantly the community. Sonia has dedicated almost all her spare time in building and developing the dance school sharing what Bhangra has offered her to other students, and built it to its current growth; 200 students performed at the 2015-year end show, held on May 10, at the University of Victoria. Along with Sonia are students some who started at the young age of 4 or 5, three of which in 2016 received recognition of 20 years of dedication and commitment to Bhangra, the school, and for mentoring other students, by Saanich Mayor Richard Atwell. The three students are Ms. Janessa Sundher, Ms. Meera Kashyap and Ms. Krishna Kashyap. Other teachers who continue to join Sonia in this journey are on our Teacher Bio page. In 1998, Sonia Grewal, for her work for the school was nominated by a family and recognized nationally for making a significant contribution to society, in Ontario by the Lieutenant Governor, Ms. Hilary Weston, which was organized by the Canadian Flare Magazine, chosen as the only organization to receive this recognition from British Columbia (BC). The school continued to make major contributions to society, partake in special events, ceremonies, inaugurations, and performances. S.E.P. also helped to raise funds for many organizations. In 1997, S.E.P. coordinated a dinner and dance with the India and Canada Association of Victoria, celebrating the 100 years of the first Sikh’s to come to Canada. This was made possible by the senior advanced team at that time, Mrs. Amy Khangura (nee Grewal), Mrs. Aman Ghag (nee Nirwan), Ms. Jaswinder Bamra, Ms. Harparm Sra, Ms. Sherry Dhillon, and Ms. Suman Atlas. In 1998 S.E.P. participated in the cultural fair at the Soen Canada Education Centre. Students such as Ms. Ruby Rana initiated our mentorship programs in 2001-2004. Our Mentorship Program was about working with Indo-Canadian women whom were and are still considered leaders in their work area. Students found their leaders and spent time getting to know them and build their career aspirations, hopes and dreams by building those relationships. Many of these students themselves have completed master level education programs or are currently professionally working. In 2005, S.E.P. participated in the Inter-cultural Association of Greater Victoria, Open Air Community event. In 2005, the school was part of the welcoming ceremonies for the Tall Ships Society inaugural event, and in 2006, was the lead for the Girl Guides of Canada’s International Event celebrating the sister city relationship between Victoria, BC, Canada, and Puna, India. Also in 2006, the school participated at the inaugural World Martial Arts opening ceremony held at the Bear Mountain Arena, in Langford, BC. The students have had the unique opportunity to host and meet famous singers from Punjab India, during concerts held in Victoria. The school has participated in many festivals such as the Dragon Boat Festival, Indiafest, Strawberry Festival, Folkfest, Vancouver Island International Exhibition, to name a few. We have also held major workshops over the years, some on social issues or development building on topics such as bullying, fitting in, communicating with parents, or communicating with teens, problem-solving, respect, and positive thinking. Ms. Ruby Rana and Mrs. Amy Khangura (nee Grewal) organized these workshops and were initiated by students whom were confused and upset with the death of Ms. Rina Virk. We also have held several dance workshops, one at the Inter-cultural Association of BC, to help raise funds for projects; for the BC Federation of Women at the University of Victoria; the Ministry of Health Services/Healthy Living & Sport as part of their active living initiatives; reunions, dance academies, and at the Ministry of Environment. In 2007 we held as a fundraiser at Silver City a fun movie production of the last 15 years for families and the community. Also in 2007, our team was selected for the inaugural International Bhangra (dance) Competition for junior teams, ages 12-18, organized by the Vancouver International Bhangra Celebration Society (VIBC). We also held as a fundraiser a matinee movie on a major leader in Sikh history on Maharaja Ranjit Singh with partnership with Punjabi Dharkan TV. In 2007 S.E.P. received the Grace of Movement Award at the Greater Victoria Performing Arts Festival. In 2008, the school was invited to perform at the Royal BC Museum, as part of the FREE SPIRIT Exhibit programs, called “From the World to BC” series, on April 26. The school performed their annual year-end show celebrating Visakhi (the Sikh birth and New Year), the official date which is April 13. One of the teams did a skit depicting first Sikh men and women that made a major contribution in Canada. The school was asked to consult in designing and providing information for the cultural display of the Bhangra and Giddha dance. Sonia met with the Program Developer every 2 weeks, to plan a special performance of dance, music and drama to celebrate Visakhi. She designed the presentation, prepared the students, provided props and all stage management for the performances. In 2009, the school was selected for the largest international dance competition in Toronto Ontario, called Bhangra Nation; this was the first team to ever be representing Victoria and Vancouver Island and BC at this level of dance competition in this year. In 2010, the school was invited by the Premier’s Office, to perform as part of the ceremony proclaiming the month of May, as Asian Heritage Month, at the BC Legislature. In 2011 the students performed for the Auditor General’s as part of their staff wellness initiatives celebrating “Diwali”. Over the years the students of various age levels have performed at many elderly residential homes and hospitals in the Greater Victoria area. Each event was organized to provide a social event with the theme of India to empower the elderly and to provide social enjoyment. Many times at these events students met the elderly and would hear stories of how one met another soldier from India, or how one lady spent her childhood in India. In 2012 the senior advanced team (called Bhangra4Life or senior advanced students) participated in the Heart and Stroke TV Commercials and were aired on OMNI TV BC Punjabi Edition on channel 10, targeting the Indian community to make healthy food choices and live a healthy life. The team also participated in the Empress Hotel annual staff gala event with the theme “Gateway to India”. Eighteen students were accepted to perform in Disneyland by far the most memorable and amazing experience in our 20 years. In efforts to fundraise for the Disneyland trip an event was organized by the mother’s of the students traveling called “Ladies Shaam Kids deh Naam” (an event for women for the sake of the children), (please refer Photo Wall on the website) it was one of the largest events held in 2012, where lineups were far reaching that circled outside the building. We thanks all the community sponsors that helped with this fundraiser. In 2013, the school celebrated their 20 years, at the University of Victoria, Farquhar Auditorium, with special guest, the Honourable Judith Guichon, Lieutenant Governor of BC. The students of the Senior Intermediate Team were accepted to the Vancouver International Bhangra Celebration in May of 2013. As well our two younger teams ages 4-6 performed at the Corporation of the District of Saanich Carnival of the Arts for Children at the Cedar Hill Recreation Centre, and are participating each year. We also performed at the Royal Roads University International Education Week celebrations, as well as in November 23 2014 our advanced co-ed team participated as performers in the collaboration drama piece of the University of Victoria History/Drama Department and the BC Maritime museum, called “Panama Maru -On Trial!” a true rendition of the actual supreme court case regarding the Japanese shipliner Panama Maru bringing with it men and some women from India. In 2014 Shan-e-Punjab held their 21st year-end show at the University of Victoria. In 2014 our Senior Girlz and Cre8ive co-ed team were selected to perform amongst 300 performers for the 10th anniversary of VIBC they danced amongst major international teams such as Bhangra Empire. In 2014 we held our 21st year-end show celebrating Visakhi at the University of Victoria. In August of 2014, the school participated in the opening ceremonies of the 20-year reunion of the 1994 Victoria Commonwealth Games, held at the Pacific Institute of Sports Excellence. Shan-e-Punjab was selected because the theme of the 20-year reunion was “a legacy that grew from the games”. As mentioned earlier the first performance was for a pre-event, which was the opening of the Saanich Commonwealth Pool, which held the Flag of Nations event as well as the inaugural All One Family event. As well in August, we held a Bhangra Workshop for the 30-year reunion of the Lester B Pearson College. We also held a Bhangra workshop for 90 students of the Dunsmuir Dance Academy, in Metchosin, and 23 students performed for the first time in our year-end show. We also performed at the female traditional celebration of Teeyan, Punjabana Da Mela; also celebrated in the 120 year Vancouver Island Exhibition in Nanaimo BC. We also performed for a charity dinner dance collecting monies for the Daswand Foundation organized by Lashkara Punjabi TV. Our Senior Intermediate team once again organized the annual Diwali/Halloween party we had approximately 144 students participating. We have participated in the Indiafest since its inauguration. Since 2007 (see above) S.E.P. has participated in the downtown Vancouver Bhangra celebrations organized by the Vancouver International Bhangra Celebration (VIBC) www.vibc.org. The effort, passion and commitment that goes into this event are absolutely amazing, this event for us provides an opportunity to not only meet many acclaimed teams from North America, but also provides a platform to perform and be in a family of youth who share the same passion. We applaud the founder Mr. Mo Dhaliwal, Ms. Anita Laland Ms. Sukhi Ghuman and all of the volunteers to make this happen! In 2015 senior advanced students performed in the Chinese New Year event held at the University of Victoria. In 2015, the Smalltown Bhangra team performed at the St. Margaret’s School International Day in February. As well this year, two teams represented SEP, bhangra4life and smalltown teams, at the Vancouver International Bhangra Celebration (VIBC). Shan-e-Punjab also taught Bhangra and Bollywood to the Sooke Dance Academy, approximately 30 students who participated in our year-end show. In 2015 Shan-e-Punjab performed at the Vikes opening season game for basketball, and the opening of the CARSA building. In all, SEP plans to participate in as many games as possible, for the 2015/2016 year. As well one of our students Ms. Punam Randhawa, as well as a Nursing student acted with some famous Punjabi actors, Diljit Dosanjh, Neeru Bajwa and Mandy Takhar in a movie that was filmed in Victoria called Sardaarji, her part is of the teacher that introduces Diljit Dosanjh to the Salsa instructor (Mandy Takhar). As well each year our advanced teams and some of our younger teams have performed at many family events in the community. As well Shan-e-Punjab established its first scholarship in partnership with Mr. Rajinder S. Sahota and Mr. Sonny Sidhu of Acheson Whitley Sweeney Foley Injury Lawyers. In 2017, performances included being invited by the City of Victoria through Atomique Productions and the Spirit Committee to be a part of the Canada150 year celebration, at the Inner Harbour Victoria BC. In 2018 we prepare for our 25 year celebration so we welcome volunteers, ideas and everyone to get involved.